Meeting Julie has been much fun and inspiration. As a glass designer, I approached her company last year with the idea of collaborating on projects in which etched designs in glass may be incorporated. From the start, I admired her clear business approach, obvious creativity and ability to think outside the box, and at the same time so warm and approachable. We have recently developed designs for a glass screen which creates privacy for a large bedroom window, and also a large panel in a living room window to beautify the view towards the street. Her input is invaluable and I look forward to working together again. 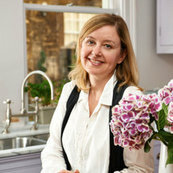 The showroom in Bradford on Avon is well worth the visit to see the quality of her kitchen design.